Welcome to Auburn Animal Hospital. Sign-up using the form or call us at 661-872-0363 to take advantage of what we have offer. Located in Bakersfield the veterinarians at Auburn Animal Hospital are committed to your pet's health. Bakersfield based Auburn Animal Hospital excels in the science of Veterinary medicine and was founded in 1990. 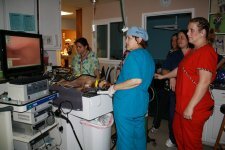 Since then Dr. Kristy Utt and our staff have excelled in compassionate veterinary care in the Bakersfield area. Auburn Animal Hospital is a full-service animal hospital whose mission is to provide the highest standard of veterinary care for pets. We provide friendly, informative, and supportive services for you and your pet, while maintaining a superior working environment for our employees. Auburn Animal Hospital offers the Bakersfield animal community emergency veterinary services as well as medical, surgical, and dental veterinary care. With an in-house pharmacy and access to specialists, our facility offers a one stop for your pet's health and medical care. 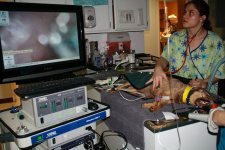 At Auburn Animal Hospital our equipment is "State of the Art" to ensure our patients have the finest, up-to-date treatments available. One of our patients undergoing an endoscopy procedure. "These are the most amazing people. They saved our little girl and loved on her like we would have. I don’t think I could ever thank you all enough for loving Roxy and giving us more time with her. The best!!" "Dr. Davidson treats my dog like her own. The whole staff is so sweet, loving, and gentle. Their prices are also very fair. I’m so glad I found them to help care for my fur baby."